Auisle or Óisle (Old Norse: Ásl or Old Norse: Auðgísl; died c. 867) was a Viking[nb 1] leader in Ireland and Scotland in the mid-late ninth century. He was the son of the king of Lochlann, identified in the non-contemporary Fragmentary Annals of Ireland as Gofraid, and brother of Amlaíb Conung and Ímar, the latter of whom founded the Uí Ímair dynasty, and whose descendants would go on to dominate the Irish Sea region for several centuries. Another Viking leader, Halfdan Ragnarsson, is sometimes considered a brother. The Irish Annals title Auisle, Ímar and Amlaíb "kings of the foreigners". Modern scholars use the title "kings of Dublin" after the Viking settlement which formed the base of their power. Auisle is mentioned three times in contemporary annals. In the first entry, dated 863, he and his brothers are recorded as having raided Brega, including underground tombs at Achad Aldai, Cnodba, and Dubad. The second, dated 866, records Auisle and Amlaíb raiding Pictland, taking away many hostages. In the final entry, dated 867, the death of Auisle at the hands of unnamed kinsmen is reported. According to the later Fragmentary Annals his brothers Amlaíb and Ímar plotted his death, with Amlaíb striking the killing blow. The earliest recorded Viking raids in Ireland occurred in 795. Over time, these raids increased in intensity, and they overwintered in Ireland for the first time in 840–841. Later in 841 a longphort was constructed at Áth Cliath (Irish for hurdled ford), a site which would later develop into the city of Dublin. Longphorts were also established at other sites around Ireland, some of which developed into larger Viking settlements over time. The Viking population in Ireland was boosted in 851 with the arrival of a large group known as "dark foreigners" – a contentious term usually considered to mean the newly arrived Vikings, as opposed to the "fair foreigners", i.e. the Viking population which was resident in arrival prior to this influx. [nb 2] A kingdom in Viking Scotland was established by the mid ninth-century, and it exerted control over some of the Vikings in Ireland. By 853 a separate kingdom of Dublin had been set up which claimed control over all the Vikings in Ireland. Amlaíb, son of the king of Lochlann, came to Ireland, and the foreigners of Ireland submitted to him, and he took tribute from the Irish. Lochlann, originally Laithlinn or Lothlend, the land where Amlaíb's father was king, is often identified with Norway, but it is not universally accepted that it had such a meaning in early times. Several historians have proposed instead that in early times, and certainly as late as the Battle of Clontarf in 1014, Laithlinn refers to the Norse and Norse-Gael lands in the Hebrides, the Isle of Man, the Northern Isles and parts of mainland Scotland. Whatever the original sense, by the twelfth century, when Magnus Barefoot undertook his expedition to the West, it had come to mean Norway. The caves of Achad Aldai, and of Cnodba, and of Boadán's Mound above Dubad, and of Óengoba's wife, were searched by the foreigners—something which had never been done before. This was the occasion when three kings of the foreigners, i.e. Amlaíb and Ímar and Auisle, plundered the land of Flann son of Conaing; and Lorcán son of Cathal, king of Mide, was with them in this. Beginning around 864 the three brothers halted their campaigns of conquest in Ireland, and instead campaigned in Britain. Ímar disappears from the Irish Annals in 864, and does not reappear until 870. This has led some scholars to conclude he is identical to Ivar the Boneless, a Viking leader who was active in England during this period as a commander of the Great Heathen Army. In 866 Amlaíb and Auisle led a large army to Pictland and raided much of the country, taking away many hostages. Auisle, one of three kings of the heathens, was killed by his kinsmen in guile and parricide. The two brothers, Amlaíb and Ímar, went to consult about the matter of the young lad Óisle; although they had hidden reasons for killing him, they did not bring these up, but instead they brought up other causes for which they ought to kill him; and afterwards they decided to kill him. When Amlaíb heard that, he was seized with great jealousy, and he drew his sword, and struck it into the head of Óisle, his brother, so that he killed him. After that all rose up to fight each other (i.e. the followers of the king, Amlaíb, and the followers of the brother who had been killed there); then there were trumpets and battle-cries on both sides. After that the camp of the slain brother was attacked, his followers having been slaughtered. There were many spoils in that camp. The king had three sons: Amlaíb, Ímar, and Óisle. Óisle was the least of them in age, but he was the greatest in valor, for he outshone the Irish in casting javelins and in strength with spears. He outshone the Norwegians in strength with swords and in shooting arrows. His brothers loathed him greatly, and Amlaíb the most; the causes of the hatred are not told because of their length. Some scholars identify Halfdan Ragnarsson as another brother. This identification is contingent upon Ímar being identical to Ivar the Boneless: Halfdan and Ivar are named as brothers in the Anglo-Saxon Chronicle. [nb 8][nb 9] According to the Annals of Ulster Amlaíb's son Oistin was slain in battle by "Albann" in 875. This figure is generally agreed to be Halfdan. If that is correct, then it may explain the reason for the conflict: it was a dynastic squabble for control of the kingdom. One potential problem is that according to Norse tradition Ivar and Halfdan were the sons of Ragnar Lodbrok, whereas Ímar and Amlaíb are named as sons of Gofraid in the Fragmentary Annals. However, the historicity of Ragnar is uncertain and the identification of Ragnar as the father of Ivar and Halfdan is not to be relied upon. Death of Auisle's son at the hands of Iergne's son and the daughter of Mael Sechnaill. The much later Chronicon Scotorum says something similar, stating that it was Ottár son of Járnkné, possibly identical with Ottir Iarla, and Muirgel daughter of Máel Sechnaill mac Máele Ruanaid who arranged the killing, but no motive is given. ^ The definition as given by Downham is used here — Vikings are "people of Scandinavian culture who were active outside of Scandinavia". ^ Dubgaill and Finngaill respectively in Old Irish. Amlaíb and his kin are counted among the Dubgaill. ^ The Fragmentary Annals were written several hundred years after the events they describe, and are considered less reliable than earlier annals such as the Annals of Ulster which may have served, along with historically dubious sagas, as partial sources for the Fragmentary Annals. ^ Ó Corrain dates this to 852–853. ^ Some sources use the name "Máel Sechnaill" and some use "Máel Sechlainn" to refer to this person. 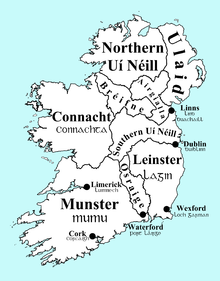 ^ "Norse-Irish" is a translation of the Old Irish term Gallgoídil (literally Foreigner-Gaels). The origins of this group are debated, but they are usually considered Vikings of mixed Gaelic and Scandinavian culture. They do not appear in the Irish Annals after 858, possibly because in later years mixed-ethnicity was the norm, rather than the exception. ^ Thirty years previously Muirecán and his kin had claimed to be overkings of Leinster, but by the time of his death the success of Máel Sechnaill in imposing his authority in Leinster, combined with debilitating Viking raids had reduced the territory ruled by Muirecán's dynasty to "Naas and the eastern plain of the River Liffey". ^ The identification of Ímar and Ivar as being one and the same is generally agreed upon. ^ Another unnamed brother is mentioned in the Anglo-Saxon Chronicle: "...the brother of Ingwar [Ivar] and Healfden [Halfdan] landed in Wessex, in Devonshire, with three and twenty ships, and there was he slain, and eight hundred men with him, and forty of his army. There also was taken the war-flag, which they called the raven." ^ Downham, pp. 25, 257, 263 & 266. "Fragmentary Annals of Ireland". Corpus of Electronic Texts (5 September 2008 ed.). University College Cork. 2008. Retrieved 29 November 2014. Anderson, Alan Orr (1990). Early Sources of Scottish History A.D 500–1286. 1. Stamford: Paul Watkins. ISBN 1-871615-03-8. Accessed via Internet Archive. Clarke, Howard B.; Ní Mhaonaigh, Máire; Ó Floinn, Raghnall (1998). Ireland and Scandinavia in the Early Viking Age. Four Courts Press. ISBN 978-1-85182-235-5. Costambeys, Marios (2004). "Hálfdan (d. 877)". Oxford Dictionary of National Biography. Oxford University Press. doi:10.1093/ref:odnb/49260. Retrieved 20 December 2014. Subscription or UK public library membership required. Helle, Knut, ed. (2003). The Cambridge History of Scandinavia. Volume 1: Prehistory to 1520. Cambridge: Cambridge University Press. ISBN 0-521-47299-7. Ó Corrain, Donnchad. "The Vikings in Scotland and Ireland in the Ninth Century" (PDF). Peritia. 12: 296–339. Radner, Joan. "Writing history: Early Irish historiography and the significance of form" (PDF). Celtica. 23: 312–325. Archived from the original (PDF) on 2015-09-23. Woolf, Alex (2007). From Pictland to Alba: 789 - 1070. Edinburgh University Press. ISBN 978-0-7486-1234-5. This page was last edited on 31 March 2019, at 13:01 (UTC).